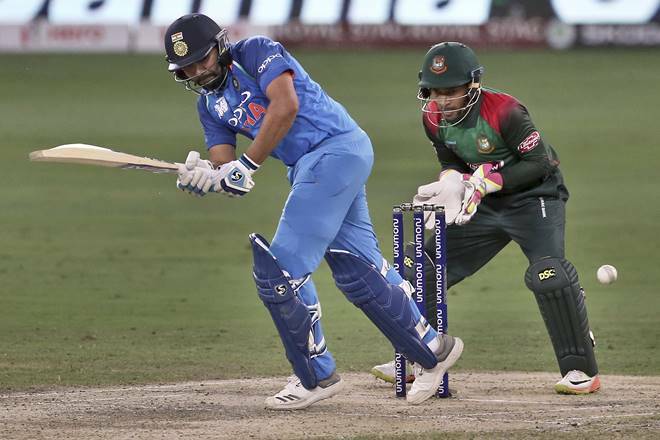 India vs Bangladesh, Asia Cup 2018 highlights: Skipper Rohit Sharma won the toss and elected to bat first. The Indian cricket team have made one change bringing in Ravindra Jadeja. Catch IND vs BAN ODI updates here. India vs Bangladesh: The super four match promises to be a blockbuster. 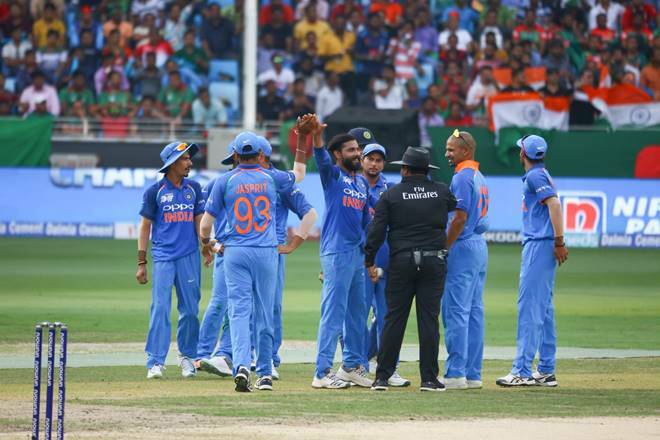 India vs Bangladesh, Asia Cup 2018 highlights: Asked to bat first, Bangladesh team was all out for 173 runs in the first Super Four match of the Asia Cup 2018 match against India. For Bangla Tigers, Mehdy Hasan top scored with 42 runs. For India Ravindra Jadeja took 4 wickets. Earlier, Rohit Sharma won the toss and elected to bowl first against Bangladesh. Jadeja who last played on ODI in June 2017 replaced the injured Hardik Pandya in the playing XI while the rest of the team remains same. Bangladesh, on the other hand, with seasoned campaigners like Mashrafe Mortaza, Mushfiqur Rahim, Shakib Al Hasan and Mahmydullah Riyadh has the potential to beat any side on its day. But, inconsistency has cost the team in the recent past as seen against Afghanistan. Overall, the match has more ingredients to become a blockbuster than the one against Pakistan. Another wicket for India. Ravindra Jadeja gets rid of Shakib AL Hasan for 17. On a simple delivery of Jadeja, Shakib mistimed and played sweep shot which landed directly in the hands of Dhawan. Match over now. Team India beat Bangladesh by 7 wickets. Skipper MS Dhoni slams 83 runs off 104 balls to help his side win the match. Men in Blue will now face Pakistan on Sunday. Bangladesh will next face Afghanistan. MS Dhoni goes for 33 runs. Caught by Mohammad Mithun off the bowling of Mashrafe Mortaza. India now need 4 runs to win with 7 wickets remaining. Rohit Sharma is batting on 82 runs. Rohit Sharma's brilliant innings has helped india to be in strong postion against Bangladesh. Men in Blue now 28 rins away from win. India now need 44 runs to win with 22 overs remaining. While Rohit Sharma is batting on 64 runs, MS Dhoni is on 10 runs. India 130/2 in 28 overs. India lose their second wicket as Ambati Rayudu goes for 13 runs. India 116/2 in 24.4 overs. Rohit Sharma batting on 59 runs, while new batsman MS Dhoni is on 3 runs. India now need 58 runs to win against Bangladesh. Skipper Rohit Sharma brings up his 50 with a huge six over deep mid wicket off the bowling of Hasan. Takes India's score to 105/1 in 23.2 overs. Rayudu is currently batting on 13 runs off 26 deliveries. Men in Blue now need 80 runs of 172 deliveries to win against Bangladesh. Rohit Sharma is batting on 44 runs and Ambati Rayudu is on 12 runs. India 97/1 at the end of 22 overs. Shikhar Dhawan's is the lone Indian wicket to fall till now for India. Skipper Rohit Sharma hits a huge six off the bowling of Shakib Al Hasan . While he is batting on 29 runs, Team India is on 75 runs at the end of 17 overs. Men in Blue now need 98 runs ro win with 32.3 overs remaining. Shikhar Dhawan is out. Goes for 40 runs. He is declared leg before off the bowling of Shakib Al Hasan. India now 63/1 in 14. 4 overs. Next batsman in is Ambati Rayudu. India score 50 runs in the tenth over. Shikhar Dhawan and Rohit Sharma continue to dominate the show. Both the openers are in total control. Shikhar Dhawan and Rohit Sharma are looking comfortable against the Bangladesh bowlers. Both the openers have put 37 runs on the scorecard in 8 overs. Shikhar Dhawan hits a brilliant four off the bowling of Mashrafe Mortaza. India has so far scored 25 runs in 3 overs. They now need 159 runs to win against Bangladesh. Spinner Ravindra Jadeja made a a superb return to ODIs with a four-wicket haul. He played key role in India dismissing Bangladesh for 173 in a Super Four match of the Asia Cup being held in Dubai. It was his his first ODI since July 2017. Team India will soon come out to bat. Bangladesh have set them the target of 174 runs to win. Tight bowling and superb fielding by Men in Blue saw India bowling out Bangladesh for 173 runs. Bangladesh batsmen were getting out like a pack of cards in their innings. Only Mehdy Hasan top scored with 42 runs. Skipper Mashrafe Mortaza also contributed 26 runs for his team. Bangladesh all out for 173 runs. India now need 174 runs to win in allotted 50 overs. For Bangladesh Mehdy Hasan top scored with 42 runs, while ravindra Jadeja was te most successful Indian bowler taking 4 wickets. Bhuvneswar Kumar and Bhumrah took 3 wickets each. Bangladesh have lost their ninth wicket as Hasan goes for 42 runs. He is caight by Shikhar Dhawan off the bowling of Bumrah. The team is now 169/9 in 47.3 overs. The last pair at the crease now for Bangla Tigers. Bangladesh lose 8th wicket. Mortaza goes for 26 runs off the bowling of Bumrah, after hitting two huge sixes. At the moment, Bangladesh 167/8 in 47th over. Mortaza and Mehidy Hasan had together put on more than 50 runs partnership for 8th wicket. Mashrafe Mortaza and Mehidy Hasan have so far put on 47 runs partnership. While Mortaza is batting 10 runs Hasan is batting on 37. Both batsmen trying to resurrect Bangladesh innings against India. Bangla Tigers at the moment 150/7 in 45th over. Mehdi Hasan goes for another six off the bowling of Chahal. The batsman comes forward and hits huge six over the cover in the 43 over of the Bangladesh innings. The batsman has two sixes in this innings against India so far. Bangladesh now 145/7 in 43.2 overs. Mehdi Hasan goes for six off the bowling of Chahal. He hists the huge six over mid wicket, showing his intentions clear. The current partnership for the 8th wicket is 29 runs. In last 5 overs Bangladesh have score 19 runs and lost 2 wickets. Till now Bangladesh have score 120 runs for the lose of 7 wickets. While Mehdi Hasan is batting on 15 runs, Mashrafe Mortaza is at 4 runs. While Jadeja has taken 4 wickets for India, Bhuvneswa Kumar has taken 2, whule Bumrah got 1 wicket till now. Bangladesh lose 7th wicket as Mosaddek Hossain goes for 12 runs. He is caught by MS Dhoni off the bowling of Ravindra Jadeja. They are now struggling at 101/7 in 33.2 overs. Ravindra Jadeja has so far taken 4th wickets for India in 10 overs. 100 runs have come up for Bangladesh at the end of 32 overs. While Mosaddek Hossain is batting at 11 runs, Mahmudullah is at 25 runs. Both batsmen have so far put on 35 runs partnership for the sixth wicket. Mosaddek Hossain and Mahmudullah are batting carefully at the moment after Bangladesh lost their five wickets. While Mahmudullah is batting on 21 runs, Mosaddek Hossain is batting on 10 runs. In last 5 overs, Bangla tigers have scored 19 runs. Bangladesh batting cautiously at the moment after the fall of 5 wickets in the Asia Cup match against India. Both batsmen at the crease are rotating strikes scoring one and two runs. They are 87/5 at the end of 29 overs. India and Bangladesh have so far played 33 ODIs against each other. While India have won 27 of them, Bangladesh won 5. One match was a tie. MS Dhoni tried to stump out Mosaddek Hossain off the bowling of Kuldeep Yadav. Batsman's feet on the crease. Not out. In last 5 overs Bangladesh have score 11 runs. Their current run rate is 3.12. At the moment Bangladesh are 78/5 at the end of 25 runs. For India Ravindra Jadeja has picked 3 wickets till now. India made one change in the team with Ravindra Jadeja coming in place of the injured Hardik Pandya. For Bangladesh, Mushfiqur Rahim and Mustafizur Rahman are back in the side in place of Mominul Haque and Abu Hider. The conditions in UAE have tested the teams so far with a number of players leaving the field with injuries. The weather is likely to remain the same even on Friday. Both the teams will have support in the stands and the fans can expect an exciting if not high-scoring encounters.